There’s a brand new kid on the block and girlfriend, she’s got TALENT! 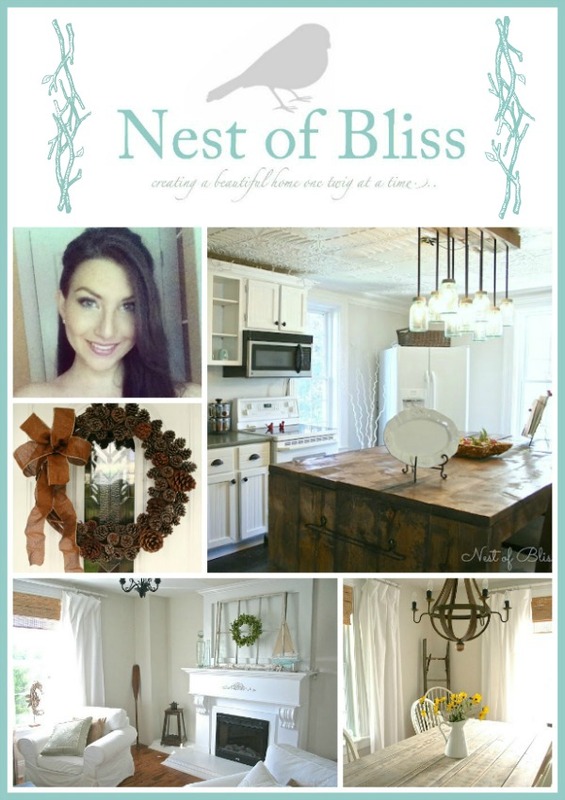 I’m excited to introduce y’all today to Brandi from the DIY blog: “Nest of Bliss” – Creating a Beautiful Home one Twig at a Time. I came across Brandi’s lovely blog recently and was totally wowed by her eye for design, DIY skills, and love of coastal decorating. For this Guest Feature Friday, Brandi will show us how to give your kitchen a Budget Cabinet Makeover by refacing the cabinets with a bit of wood and you won’t believe this… bead board wallpaper! How clever is that? Please give Brandi a warm welcome! Hello Sand & Sisal readers! I’m Brandi from Nest of Bliss, I’m so excited to meet you all! I’ve been a huge fan of Kim’s for a long time now, so when she asked me to come visit today I was delighted! And here’s our kitchen today. Still a little ways to go, but progress is progress, right? It’s been wonderful meeting you all! Please stop by Nest of Bliss for a visit soon! You can also find me on Facebook, Pinterest, and Google +! Wasn’t that budget cabinet makeover amazing? What a transformation! Please give Brandi your comment love and be sure to hop over and visit her blog and follow her on social media. WOW this is beyond amazing and what an amazing transformation!!! I Agree. Brandi and her honey have been doing an amazing job. The kitchen is really shining with the improvements they have made!! Totally awesome! Love that beadboard wallpaper. What a great idea! Love the look of the bead board wallpaper. Wondering where to buy and is it washable. I’m thinking it could get really nicked up in kitchen. How’s it working so far? Thanks for the idea!! What a wonderful way to update and beautify your kitchen. Looks like a million bucks! Brandi, I am drooling over the island in your kitchen. Can I ask where you found it? I plan to have a tutorial in the future. Love this. I have the same plain ugly cabinets in my kitchen. Thanks for the tutorial! Love the cabinets… did you also paint the wall paper? Or just the trim? What did you do on the drawers? Are they bead board paper too? 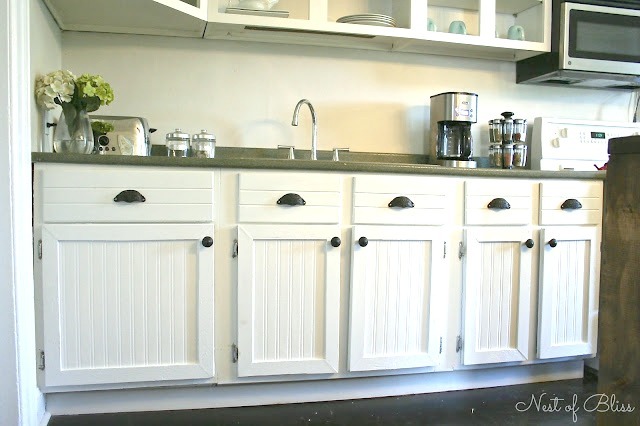 This is exactly what I was looking for as a cabinet makeover! Thank you! It’s absolutely beautiful, low-cost and easy to do. My wallet thanks you and my kitchen thanks you! I love it. How durable is the bead board wallpaper. I have several sheets of bead board that I picked up at yard sale. Could I use that instead of wallpaper? I have done the beadboard wallpaper on my own cabinets. I also have a 7 and 3 year old. I loved the way it looked when we did it but once my, at the time 5 year old, noticed the texture of it she notices she could use her fingernails and draw in it. It has a sort of foamy texture behind it like foam board and completely collapses when you “draw” on it. Like I said I absolutely loved the way it looks but it is NOT durable. It also nicks if you put it on a flat surface. We also put on our drawer fronts and that is where we saw nicks. Recessed is better if you don’t have a fingernail picture drawing toddler. I close on my ‘new’ house in a few wks. I’ve already ordered my bead board wallpaper. I previously had formica cabinets refaced by a ‘professional’ carpenter. 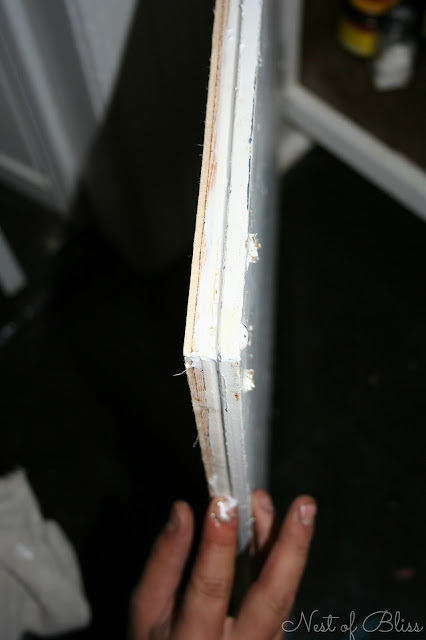 It cost a couple thousand $$$ for a not very ‘professional’ job for new doors. My new hardware(hinges) didn’t show. What did you do to prep your hinges. I’m planning on using my old porcelain knobs. I am so impressed with what you have done with your kitchen. What a great job and well done. I did 4 doors like this in my Landry room. Came out great but was not good at the 45 degree cuts so I squard them off. Love it thanks for the ideal! Great idea! Can I ask how the wallpaper’s holding up? Is it easy to clean? And where did you purchase? I guess It’s cheaper than real beadboard? Looks great! Did you paint the headboard wallpaper when you painted the trim? Yes, Brandi painted the trim and paper at the same time. It looks great doesn’t it? My kitchen doors have a beveled edge. How do you refinish? This is exactly the style I was looking for last year when we repainted the cabinets and the kitchen. I have exactly the hardware that you show but we couldn’t get the mitering to work on our doors. Hence the beadboard wallpaper still sits in the box. It never occured to me to secure the framing with screws on the inside of the cabinet doors – GENIUS! A little wood putty and a few coats of paint and no evidence! I’m going to give this another go after Thanksgiving, never give up! Thanks Barb! I’m so happy it inspired you! I have a 130 y/o farm house. I used bead board to finish out the 8″ wide doorways. 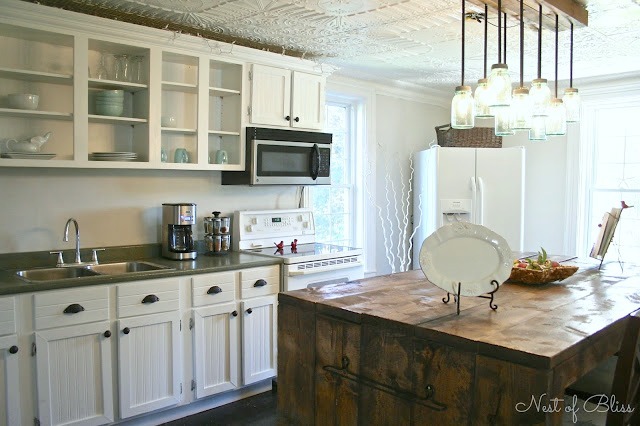 I love the idea to use the bead board wall paper on the cabinets. Great idea! How did you do the drawers? It’s amazing. I was looking for an idea for my kitchen cabinets. Had visited lots of websites. Saw nothing that compares to this. Love it. Gona use your ideas for my kitchen. Maybe you could show how you did the rest of the kitchen. aka floors, countertops, etc. Gorgeous! Have you had any issues with the wallpaper tearing? 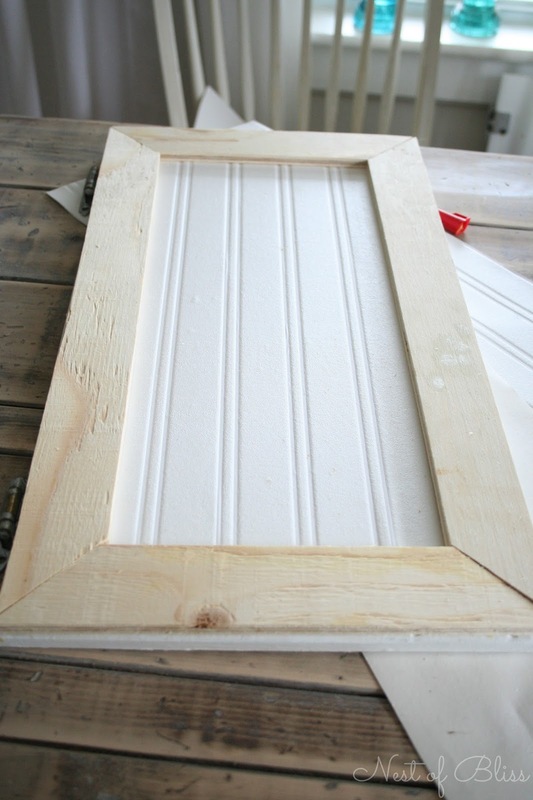 I’m debating whether to use wallpaper or real beadboard. I don’t want it to tear, but I don’t want to use real headboard because the wood layers will show on the sides. Thank you! I’ve been wanting to redo 30 year old cabinets and took this project on. It was so easy and no one can believe it is wall paper. One of the best DIY projects I have done. Don’t think there will be any problem with wallpaper tearing I think real bead board will make cabinets to thick and heavy. That is awesome Margie! Yay! 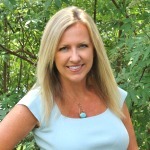 I’ll be sure to share your success and happy news with Brandi (the guest blogger). Beautifully done. My husband and I will adventure on this project soon! Just a quick question: is the wallpaper used on the drawers different from the ones used for the doors? It looks so lightly different in the picture.